​ Every New Mom Needs To See This Post! I remember when I was a new mom – the sleepless nights, the expensive diapers, wipes and formula and the constant doctor’s visits. Babys are an absolute joy but also draining on your wallet! We rounded up a big list of free baby samples and deals you can score to make it all a little easier. Buy Buy Baby – Free Goody Bag when you sign up! redeem at buybuy BABY Stores. Enamil Family Beginnings – $400 in Baby Freebies from Enfamil including formula checks, formula samples and more. Amazon Baby Box – Free full size and travel size. Includes wipes, baby wrap, onesies, diapers, and bath products worth $35. 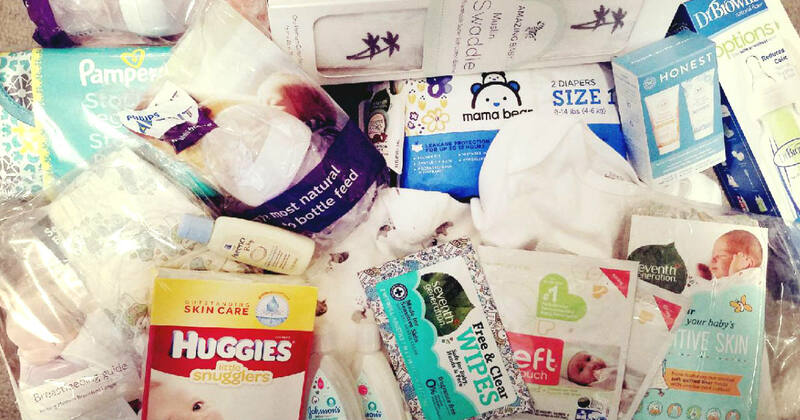 Walmart Baby Box– Free Walmart Welcome Baby Box when you sign up filled with samples. Viewpoints Baby Wrap – Free Petunia or Moby Wrap, sign up for your chance. Ergobaby Gift Card – Free $30 to use on baby carries, strollers and more! Enfagrow Toddler Formula – Free Sample of Enfagrow PREMIUM Toddler Next Step. Viewponts Cuties Wipes – Free Cuties Sensitive Wipes, sign up for your chance. MTA Baby on Board – Free Baby on Board or Please Offer Me a Seat Buttons. Born Free – Possible Free Born Free Baby Carrier. 20% off with Amazon Family – When you subscribe to at least five baby products through Amazon Family and Subscribe & Save, you’ll automatically receive 20% off. Baby Toys & Teethers – All under $5 on Amazon – hurry! Dolly Parton Imagination Library – Free Books with FREE Delivery every month until your child is 4 years old. Gymboree Classes – Free Class at Gymboree when you sign up. Pampers Rewards – Earn points from Pampers products for free Shutterfly gift cards, coupons & more goodies. Plus Win free diapers for a year! Similac Strong Moms – $400 in goodies including formula and a diaper bag. Win $2,500 Amazon Gift Card – Just Start a Baby Registry and add Chicco products!